Sometimes it is really hard to know what to get those cuddly little petites in your life. I know before I had kids of my own, I would sometimes struggle to find the perfect gift or know what was really age appropriate. Now, that I have two kids of my own and numerous others that I buy gifts for, I am starting to find a pattern in my gift giving. I love to give a book, shocking I know, an English teacher who likes to give children books. Books are really fun, but when you’re one, you always want a toy too. So I have been choosing a book and then a toy that goes along with it. One of my dear friends has the sweetest little girl who just loves books. We got her, what I think is a pretty perfect present. Although the pages are a little delicate for one year old hands, I think that reading a child a book of any format at any age is perfection. I have written about this book before, Molly Idle has created some of the most amazing illustrations in Tea Rex. This book is so cute! 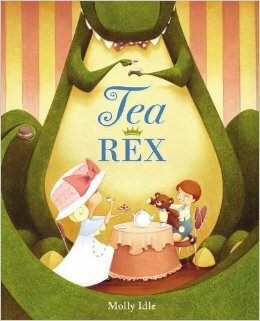 I really love this story about a T-Rex who comes over to have a spot of tea. He is just a little bit too big for a proper tea party, but that doesn’t stop him from joining in. To go along with this fabulous book, is possibly one of the cutest toys my daughter has: the Fisher-Price Laugh & Learn Say Please Tea Set. It is so incredibly sweet to watch a one year old use this tea set in her playing. She pretends to eat, rather she chews on the petifores and takes sips of tea. So precious. 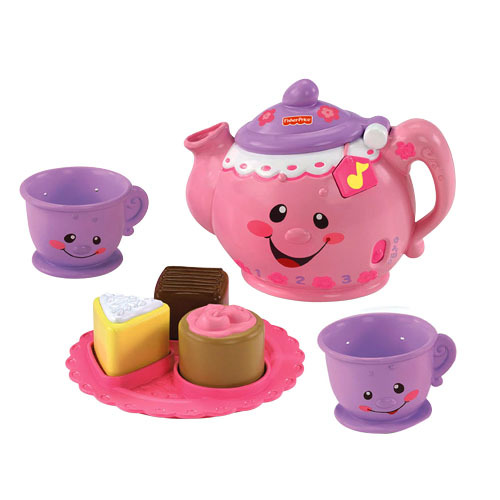 My five year old even plays with her taking turns pouring the tea (it makes a pouring sound); which makes it all the more fun to have a tea party with. This little teapot sings catchy little songs like, “Would you like a spot of tea, one for you one for me, lets take turns and always say please and thank you”. Yes, I’ve heard it a few times. Did I mention it is in a British accent? Adorable. It also has an off switch, which makes it priceless. If you like this post, check back in again, I am going to add a few more post about my favorite gifts for petites. What are some of your favorite toys to give little ones? Tell me in the comments section, I’d love to hear what your favorites are.